In the human heart, the SA node is located at the junction of the superior vena cava with the right atrium. 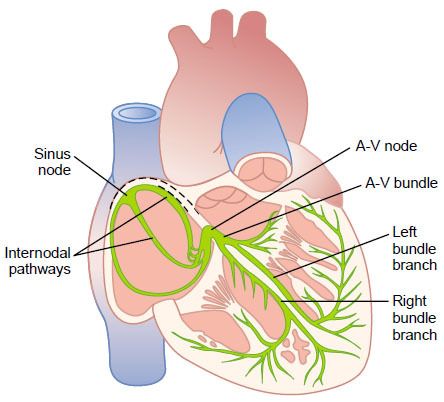 The AV node is located in the right posterior portion of the interatrial septum. c) the posterior internodal tract of Thorel. Conduction also occurs through atrial myocytes, but it is more rapid in these bundles. The AV node is continuous with the bundle of His, which gives off a left bundle branch at the top of the interventricular septum and continues as the right bundle branch. The left bundle branch divides into an anterior fascicle and a posterior fascicle. The branches and fascicles run subendocardially down either side of the septum and come into contact with the Purkinje system, whose fibers spread to all parts of the ventricular myocardium.